We all know that life can change in the blink of an eye. Such was the case for Anna Barkovskya, a visiting scholar/graduate student from the University of Trondheim in Norway. Anna had plans to spend three months working in a lab at UNC's Lineberger Comprehensive Cancer Center, with the goal of learning new, cutting edge molecular biology techniques. Her research was put on hold when one morning she woke up to blurred vision and she started having difficulty comprehending what she was reading. She went to the emergency room where a day later, world renowned neurosurgeon, Dr. Eldar Hadar, removed a benign cyst on her brain. During this time, UNC Hospitals sent an urgent letter to the Russian Embassy, requesting that Anna's mom, Yulia, be allowed to travel to the U.S.A. from St. Petersburg to be here for Anna. Thankfully, that request was granted and within a few days after her surgery, Yulia arrived. With additional support from her colleagues in the lab that Anna was doing research in, Yulia was able to stay at Family House with Anna while she went to her post-op appointments. Also there to support her during her stay at Family House was her brother-in-law, Lasse, who had flown in earlier from Oslo, Norway. When asked what their stay has meant to them, Anna replied that being here has helped with her recovery. Sharing life stories with other guests. Making new friends. Having her mom and Lasse here. Going to the Meadowmont Wellness Center for light work-outs. Sharing hot, nutritious meals with our guests. Anna, Yulia and Lasse feel that all these factors contributed greatly to her initial recovery. 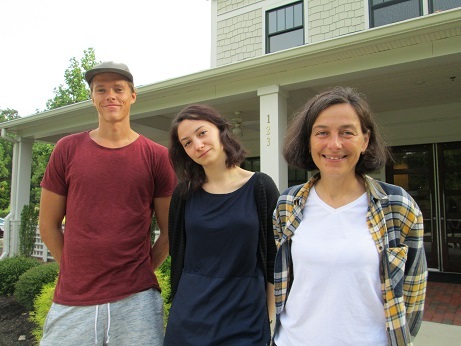 As they were leaving Family House, Anna and Yulia said they felt part of a larger story when staying here. "I feel a lot better than if I had stayed elsewhere," Anna shared. Staying here "helped settle my mind." This is particularly significant since Anna lost much of her short-term memory after the surgery, yet thankfully, she is slowly regaining it back. Anna has a promising cancer research career ahead of her. We wish her continued progress as she, her family, and friends from the lab assist her on the long road to recovery.